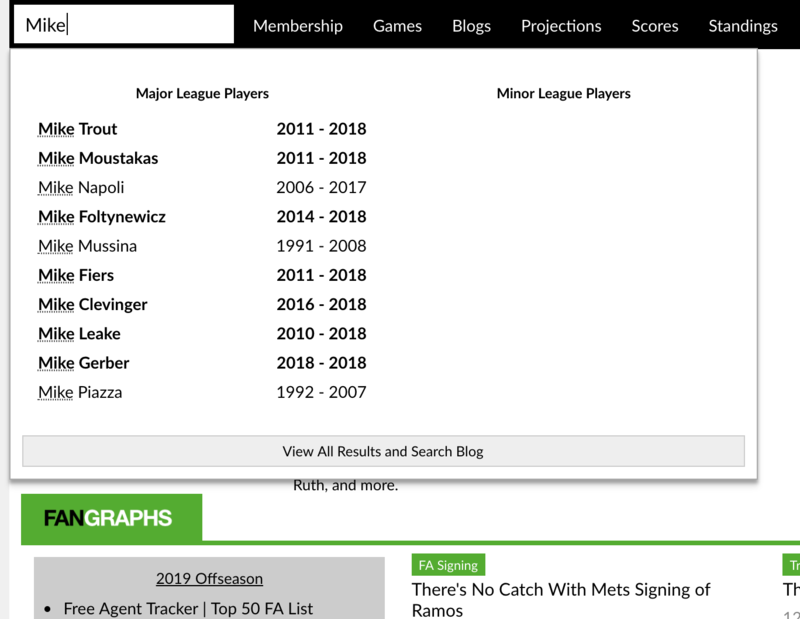 At last week’s Winter Meetings, we redesigned our search bar functionality, and we are launching it today. The search bar location and the main function haven’t changed. The search bar is in the same place, and by default has the most-viewed players. It allows you to search players and blog articles. We did a pretty significant under-the-hood update that returns more relevant results, and while we were at it, we made some interface updates. Players results are weighted by a combination of name match and the number of recent views. Active players are in bold. The partial match of a search term is also underlined the player’s name. Articles can be searched in a separate window. They are weighted by term matching, number of views, and recency. For now, we’ve only included main page articles, not articles from all of our the blogs. The other blogs will be added in the future. We included Team Pages in the results! We hoped you liked reading We Upgraded Our Site’s Search Bar by Sean Dolinar!